Recharging the aquifer – Leaky wells. Finally the much awaited monsoon will arrive on the coast of Kerala on June 1st or perhaps a day earlier. One section of the Bangalore populace is eagerly contributing to receive the promised rains and turn it into an asset. They will ensure that our groundwater banks are filled and good for utilisation throughout the year or at least a good part. These are the pre-cast concrete ring makers. They are part of the city’s informal sector and a vacant plot of land is all they need for business. They are ubiquitous especially in the suburbs of the city and they work with steel moulds and concrete. They cast the rings of various dimensions ranging from 21/2 feet in diameter to 4 ½ feet in diameter. You place an order and the rings should be ready in a fortnight at the most. Business is brisk, especially with the coming of the bye-law which makes rainwater harvesting compulsory. Pre-cast concrete rings. These are cast in informal yards. These rings are transported to site using small vehicles such as tempos and the price is actually the landed cost of the rings. The well diggers then use these rings to make ‘leaky’ wells or recharge wells as they are called here. These wells, according to the bye-laws, have to be a minimum of 10 feet in depth. Generally it is recommended that they be about 20 feet in depth. About 14 rings should be used. Rainwater from rooftops and paved areas can then be led into the recharge wells. Rainwater from storm-water drains also can be led into these wells. A precaution is to make sure that there is no polluted water such as sewage that can go in. After a preliminary filtering to keep leaves and other organic matter out the rains are recharged here. Recharge rates can vary from 1000 litres per hour to even as high as 6000 litres per hour. A Slug test, whereby water from a tanker is filled into these wells and the time taken for the water to empty noted will tell the exact rate of recharge. Depending on this parameter and the catchment area they serve sufficient number of recharge wells can be designed. Recharge wells play an important part in topping up the groundwater table of Bangalore. Every bore-well in the city should have one. Every house and apartment in the city too can have one except in areas where the water table is very high. If the conditions permit the recharge well can also be used as discharge wells and the groundwater can be used in summer time. 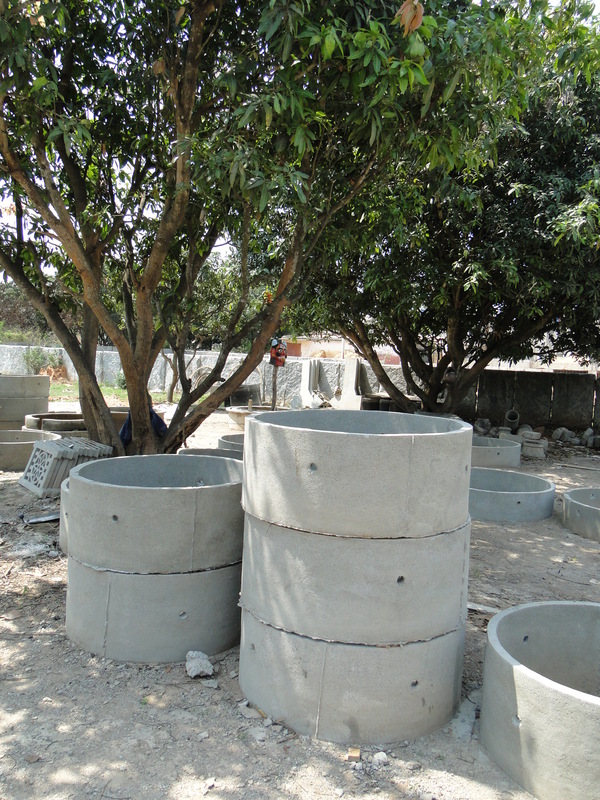 The concrete ring manufactures are environmental heroes working on livelihoods which provide water to people of the city and mitigate floods. These are the true water warriors. If it all goes to plan, buying or selling fertiliser will never be the same for the 120-odd companies that make up this Rs 1,00,000 crore industry or the 120 million farmers that rely on it. Starting next year, the government will stop its 34-year-old practice of giving the fertiliser subsidy to companies. It will instead begin a step-wise migration to a cash-transfer system, where the subsidy will eventually move directly to the bank accounts of farmers. The government hopes, this transition, which began in 2010, will be the panacea for all the ills that distorted the previous system in its various forms. Think of a two-storey building that has bloated to five floors, with extensions and alterations, some legal and some illegal. That, in an analogical nutshell, is the fertiliser ecosystem today, deformed by the constant actions—and the reactions—to the system of subsidies that shapes it. Fertiliser subsidies were introduced, in 1977, to increase agri production while insulating farmers from rising prices of a crucial input. So, the government fixed the price of fertiliser, at below market rates, and reimbursed companies for shortfalls in their cost of production. It worked initially. But, in time, it created distortions. Companies cared little for costs as the government was paying. Then, they chose to produce urea over other fertilisers because, being the base fertiliser, it drew the maximum subsidy. Since urea was also the cheapest, farmers used it more than other necessary fertilisers, harming the soil. Since the subsidy went to the company, every farmer, rich or poor, benefited from it, leaving the government with a hefty bill. The government kept tweaking policy to correct these imbalances, but it left everything fuzzy. It left companies with an inefficient operation, a lopsided product portfolio and reluctance to expand. It left the soil with a disproportionate amount of nitrogen. It left the government’s finances in disarray. A complete mess. The government, now, wants to correct all this, by overhauling the subsidy system. The latest reform began in April 2010, when the government ended the cost-plus basis of compensation to companies. Finance Minister Pranab Mukherjee took it forward in Budget 2011 with the announcement that the government will, sooner rather than later, transfer the subsidy directly to farmer bank accounts. But all this has to be done with a sense of continuity. To stretch the construction analogy, the government wants to give this irregular building a makeover. Except, it has to do this makeover even as people continue to live in the building. It has to work on parallel tracks: on one line, to phase out the old system; on the other, to ‘sell’ the technology-driven new system without causing a disruption in outcomes for companies, sellers or farmers. And without affecting India’s food security or farmer livelihoods. “When it started, the erstwhile pricing scheme was a great idea,” says S Krishnan, the previous fertiliser secretary. The Green Revolution, built on high-yielding crop varieties supported by fertiliser use, was underway. Farmers needed cheap fertilisers. The Retention Pricing Scheme (RPS), as the first avatar of the subsidy system was called, was designed to keep domestic fertiliser prices stable, international prices of fuel and raw materials notwithstanding. “It called for close management,” says Krishnan. So, the government set fertiliser prices. Then, each manufacturer would submit its costs to the government. The ministry would test these numbers against its norms. Company whose costs were higher were paid the benchmark. Those whose costs were below were paid actuals, removing all incentive for them to be cost-efficient. Says Sutanu Behuria, secretary, ministry of chemicals and fertilisers: “It (subsidy) is remitted to companies on the basis of just a certification from their chartered accountants.” In time, companies started exploiting the RPS. They padded their costs. They showed greater production—capacity utilisation of 120% was normal. The government introduced more controls. “The industry sees stringent regulations at every stage of production, distribution and marketing,” says Satish Chander, director-general, Fertiliser Association of India, the nodal body for the industry. Further, of all the nutrients soil needs, the RPS favoured basic fertilisers based on three essential ingredients: nitrogen, phosphorous and potassium (N, P and K). Within this, there was a bias towards nitrogen, namely urea. This was partly at the behest of the fertiliser industry, says a senior food policy researcher, not wanting to be identified. “Indian companies made urea. P and K were imported,” he says. “Urea makers lobbied to keep urea prices lower than P and K.” This had disastrous consequences. Non-subsidised fertilisers cost five times the subsidised ones. Unsurprisingly, companies crank out basic N, P and K fertilisers like urea, DAP, SSP and MOP, which contain high concentrations of one or two nutrients. Urea, for instance, contains 46% nitrogen. Such high concentrations are not needed, says an analyst who tracks the fertiliser industry. “Maybe a third of the nitrogen in urea gets used,” he says. “The rest leaches into groundwater or escapes into the atmosphere.” The over-subsidisation of urea, relative to potassium and phosphates, has resulted in farmers using more urea than they should. The ideal NPK ratio is 4:2:1. But in, say, Punjab, it is 23:6.7:1. Yields are falling. In 1985-86, a kg of fertiliser gave 17.8 kg of output; in 2008-09, just 9.4 kg. The government responded with policy flip-flops. For example, in 1991-92, it freed phosphatic and potassic fertilisers prices, only to reintroduce a subsidy in 1994. “Due to the uncertainty in policy, there has hardly been any significant investment in fertiliser capacity,” says Ashok Gulati, chairman, Commission for Agricultural Costs and Prices. It took a crisis to shake things up. As oil flared again in 2008-09, fertiliser input prices—natural gas and naphtha are used as feedstock—spiked. The subsidy bill increased to Rs 99,500 crore, from Rs 43,000 crore in 2007-08. As the gap to international prices widened, leakages increased. “Some fertiliser is smuggled to neighbouring countries. Some goes to other industries (like plywood),” says a joint secretary in the ministry, not wanting to be identified. “About one-fifth leaks out.” In April 2010, the government brought in three big changes. One, it decontrolled all fertilisers except urea, which accounts for two-thirds of all production. Two, it scrapped the corruptionprone RPS. It replaced it with a nutrient-based subsidy system, where it would pay companies a fixed amount for each nutrient used, regardless of their cost of production. So, for 2011-12, companies will receive a subsidy of Rs 20,111 for every tonne of nitrogen used. Three, the list of nutrients eligible for a subsidy was expanded to include sulphur, boron and zinc. Then, in Budget 2011, Finance Minister Pranab Mukherjee announced the fourth change: the subsidy will, in time, be given to the farmer as a direct cash transfer. These are game-changing alterations for the industry and every constituency that deals with it. It touches every aspect of the distortion: capacity, production, usage, prices and subsidy. By freeing product prices, the government is putting greater onus on companies and farmers to absorb price increases. Since P and K prices have been freed, when their prices increase globally, the government can choose how much to absorb by increasing the nutrient-based subsidy for these two ingredients. The rest will be left to companies to decide whether to pass on that increase to farmers or create a new mix with a lower concentration of these two nutrients. Companies have been evicted from a comfortable world where they got paid for production itself. Now, says Krishnan: “They will now have to compete to sell fertilisers—through product improvements or better services.” Companies will have greater incentive to produce fertilisers other than urea, as the subsidy of P and K now matches N. “For the first time, the subsidy on nutrients is known in advance,” says Chander of FAI. “We could not have taken a oneyear contract for, say, rock phosphate earlier.” He sees the industry expanding capacity. However, it remains to be seen if expanding the nutrient subsidy to just sulphur, boron and zinc is enough to reverse the environmental damage suffered by the soils. Again, it comes back to subsidy regulating responses down the chain. Define the nutrient list broadly and the government ends up giving a nationwide subsidy for a regional nutrient. Define it narrowly and it’s back to the NPK bias. Krishnan suggests that states can give a subsidy for nutrient deficiencies specific to their area. What about the fertiliser subsidy? To start with, the Centre’s subsidy bill will largely depend on international prices. “It will increase marginally because more nutrients are being covered,” says the joint secretary. But if the government introduces an element of targeting in cash transfers, it could slash its subsidy bill. An IIM Ahmedabad study in 2009 by Vijay Paul Sharma and Hrima Thaker shows that small and marginal farmers account for 82% of farm holdings, but consumed only 52% of the total fertiliser. Fertilier secretary Sutanu Behuria says the government is thinking of calibrating the subsidy to land holding. Cash transfers are still a work in progress and there are issues with it (See adjoining story). The new fertiliser subsidy system points in the right direction. But it’s the details of the new system that will determine if the government manages the difficult task of preserving the subsidy’s pro-agriculture and pro-poor tilt, while correcting the distortions that have crept in. The government has, all along, directed the fertiliser industry. How it has done so has kept changing. The current reform is the most significant undertaken by it since 1977. The Green Revolution is built around high-yielding crop varieties supported by fertiliser use. As the government woos the private sector, it sets the stage for nine urea plants to come up. As oil prices soar, companies say they can’t sell at the government-set price. In 1977, the Retention Pricing Scheme (RPS) is introduced: companies are reimbursed for their additional costs and a fixed profit margin. The RPS begins to miss its objectives. Companies exploit its cost-plus formula. They prefer urea to other fertilisers. So do farmers, weakening the soil. Government gropes for an alternative to the RPS. Prices of all fertilisers except urea freed. Nutrient-based subsidy replaces RPS: companies are paid a fixed amount per nutrient irrespective of their cost of production. Next move: cash transfers to farmers. (Reuters) – India will cut by a fifth the subsidy it gives to phosphate and potash-based fertilisers in 2012/13, the government said in a statement on Thursday, its latest step aimed at patching up its widening fiscal deficit. Subsides to diammonium phosphate (DAP) and muriate of potash (MoP) fertilisers will be slashed by 27.4 percent and 10 percent respectively. But it left out urea, the most used crop nutrient that accounts for the bulk of the government’s spending on fertilisers. The subsidy for DAP will stand at 14,350 rupees per tonne in next financial year beginning from April compared to 19,763 rupees for the current year. For MoP, the same has been fixed at 14,440 rupees per tonne against 16,054 this year. Subsidy rates for nitrogen, phosphate and potash nutrients are also being cut by 11.6 percent, 32.6 percent, and 10.3 percent respectively. It kept the sulphur subsidy steady at 1.677 rupees per kg. Indian farmers have complained over a sharp rise in retail prices of fertilisers, especially of DAP and MoP in the past year. Analysts said with the subsidy cut, retail prices of fertilisers were unlikely to go down. “This is negative for complex fertilisers as reduction in subsidy will limited industry’s ability to reduce maximum retail price for farmers,” Tarun Surana, analyst at Sunidhi Securities & Finance in Mumbai, said in a research note. India imports all its potash and also buys about 90 percent of its phosphate from abroad. Potash Corp (POT.TO), Mosaic Co (MOS.N), Agrium Inc (AGU.TO) , Uralkali (URKA.MM), Arab Potash Co APOT.AM, ICL Israel Chemicals (ICL.TA) and K+S are among the major potash suppliers to India. Moroccan phosphate producer Office Cherifien des Phosphates (OCP), PhosChem and Russian fertiliser group Phosagro are key DAP supplier to India. The country’s biggest importer, Indian Farmers Fertiliser Co-operative Ltd (IFFCO), said it was not planning to raise prices despite the proposed subsidy cuts. “We will not raise retail prices of DAP and MoP due to lower subsidy,” U.S. Awasthi, IFFCO managing director, told Reuters. New Delhi is widely expected to miss by a long chalk its deficit target of 4.6 percent of GDP for 2011/12. It approved this week a plan to sell some of the government’s shareholdings in state-run Oil and Natural Gas Corp through a share auction. The fertiliser subsidy bill for 2011/12 is likely to hit 900 billion rupees, more than double the budget estimate, Finance Minister Pranab Mukherjee said last year. The government began providing fertiliser companies subsidy for potash, phosphate and complex fertilisers based on content of the nutrient in the fertilisers in 2010. I am regular reader of your column in The Hindu, I have a query about open type well. We have at our house in Hanumanthanagar, Bangalore-19. Open Type well around 50 years old. Water quality was very good, recently drainage water started seeping in. we took up with BWSSB and arrested this seepage. New Drainage lines were also laid for the whole road, now that the leakage has been stopped I want to Clean up the well for our use. Please advise how to carry out the cleaning and suggest anybody who is doing such work. As the elevated tracks come up over the city a mass transport network called the metro is being built all over the city. In phases it is likely to cover over a 100 kilometre and become one of the prime modes of transport to the city. Apart from the transport benefits it will bring to the city there is one other potential benefit that could accrue to the city due to its construction. The metro rail track offers a tremendous potential for rainwater harvesting. A total length of about 45 kilometres and a width of about 12 metres means that the endowment of rainwater on the relatively very clean track with Bangalore’s rains of 970 mm annually is about 523 million litres. Considering a coefficient of runoff of 0.90 the harvestable rainwater is around 471 million litres annually. This could provide about 13,000 people with their annual requirement of water at 100 litres per day. A substantial sum. Since the metro will intend to develop a small landscaped area between piers of about 25 metres and with a width of 2.50 metres, part of the rainwater could be used for this landscape purpose. The additional rainwater could be used to recharge the groundwater aquifer without causing any urban flooding. – A rain barrel attached to every pier to store rainwater above the ground. This will enable water to be drawn by gravity for drip irrigation of the landscaped area between the piers. – A sump tank to store the water which will overflow from the rain barrel. There could be a small pumping arrangement to refill the Rain Barrel when empty and draw the water for use as and when required. The sump tank would also have an arrangement for a cowl which could be used to fill water from a private water tanker in case the sump goes empty for want of rain and during long stretches of dry days. – A recharge well to take the final overflow from the sump tank and recharge the aquifer so that the groundwater table is made up. The recharge well can also be used as a regular well in stretches where the groundwater table is high. This will also help improve both the quantity and quality of groundwater along the stretch of the metro as a positive externality. A landscape designed for low water use, say growing plants like bougainvillea, would demand roughly 4 litres per square metre daily which could be distributed through drip irrigation systems. By integrating rainwater harvesting the urban flooding issues around some areas could be addressed. If done in conjunction with the BBMP storm water drain, an integrated strategy for managing storm waters could be obtained providing great benefits to the groundwater. It is good to look at negative externalities of a project and convert them to benefits so that society at large is benefitted. In this is the path to satisfy urban water demand and become waterwise. Accra — A female Ghanaian scientist is one of four researchers from developing countries who received US$100,000 each to pursue their dream ideas for solving global health problems. Olufunke Cofie, a soil scientist at the Consultative Group on International Agricultural Research‘s Challenge Program on Water and Food will develop fertiliser pellets from treated human waste to boost agricultural productivity and improve sanitation. She is one of the latest 88 winners in the Bill & Melinda Gates Foundation‘s Grand Challenges in Global Health programme, funded through the Grand Challenges Explorations (GCE) initiative, which include scientists from Ecuador, Ghana, Kenya and the Philippines. “Recycling readily available excrement has the potential to both reduce the environmental pollution burden and prolong the lifespan of [waste] treatment plants, while also significantly improving soil productivity,” Cofie told SciDev.Net. Cofie will explore using faecal sludge as a source of organic matter and nutrients. She will also address the negative perception in some communities of using human excrement in agriculture. Since 2000, Cofie has been leading collaborative projects on turning faecal sludge and urban waste into something useful. “The award is encouraging in the sense that we can go one step further in the research process [to create pellets]. It is not an end itself but we can surely add value to what we have been doing,” she said. Since its launch in 2008, the GCE initiative has awarded grants of US$100,000 to nearly 500 researchers from more than 40 countries. Successful projects can apply for a grant of up to US$1 million. “We believe that truly transformative technologies are needed to overcome the most persistent health and development challenges,” said Chris Wilson, director of the Gates Foundation’s Global Health Discovery programme. “If ideas like the one presented by Olufunke Cofie can show proof of concept in making sanitation services truly safe and sustainable, the implication is that they can help reduce the burden of diarrhoeal disease by 20-40 per cent, and save the lives of millions of children,” he told SciDev.Net. It is an accepted paradigm that most cities in India will face a water shortage and that managing sanitation will be a huge challenge. Institutions are taking action albeit slowly. Large scale infrastructure projects are rolling out. Water lines, sewage lines and treatment plants are all coming up. However this will not be sufficient. In India it has to be all hands on board at least for some time till institutions mature and some semblance of stability is achieved in urban areas. Till that time it will be multiple-sourcing of water and sanitation services and therefore necessarily multi-management. Apartments in the city already have to deal with getting a city connection, drilling and managing bore-wells, managing private water tankers and bottled water coming in and running their own sewage treatment plants. Owners associations and facility managers are learning on the ground how difficult and complex it is to run water utilities. Individual home owners are now increasingly dependent on bore-wells and private tankers too. Many homes in the suburbs are not connected to the sewerage lines. These homes have to have their septic tanks and soak pits emptied often using vacuum trucks called ‘honey-suckers’ . Managing sewage too therefore comes in their domain. Almost all hotels and restaurants buy water from private water tankers. Some of these run in the hundreds every day. It is therefore important to engage with the problem, become aware and take action, the mantra of enlightened self interest. Certain basic things to do are to understand the source of all water being consumed in the premise. If it is coming from a private water tanker what is the source of the water? Are there water softening or reverse osmosis plants and are they doing their job? Is the effluent treatment plant functioning well and is the output water of a quality that meets standards? Is there rainwater harvesting done in the premise as per law? Is it being maintained well and is it functioning? A retired Professor from the University of Agricultural Sciences has implemented rainwater harvesting for his home, maintains the storm water drain in front of his house, with the assistance of his wife they help water and maintain a beautiful park in the neighbourhood and he coordinates with the Resident Welfare Society to ensure even distribution of the city utility water to all homes in the neighbourhood. A housewife in a posh multi-storied apartment newly built coordinates with the builder to understand all the water and sanitation facilities in the premise so that all residents are ensured adequate water supply. A senior citizen has cleaned up and recharged his old open well which now provides water for the whole year while neighbouring homes buy water. Active citizens are trying to group and sane several tanks around the city from encroachment, illegal dumping and misuse. Citizenship is as much about responsibilities as it is about rights. An aware citizenry can make the difference between sustainable water and a good environment or shortages all around. Which side are you on?